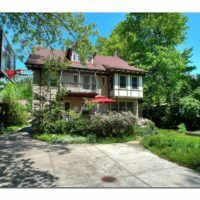 This home on Scarborough is the epitome of a Cleveland Heights home. Situated on one of the larger lots in the area , this 6 bedroom, 4 bathroom home is a gem on one of the most beautiful streets in the city. Enter through the grand foyer and you will notice two sets of glass door and a grand staircase. One set of doors opens to a formal dining room rich with architectural detail and then on to a beautifully updated chef’s kitchen. The other set of doors leads to an expansive living room, a sun filled family room/solarium and then on to a 3 season porch. The second level boasts 4 ample bedrooms, 2 full bathrooms and a large banister throughout the hallway. The third level is currently being used as a rental living suite and is has 2 large bedrooms, a huge hallway/ loft like area and a full bathroom. The lower level has a fun ping pong / play room and an exercise room. The all brick, Arts & Crafts style home is a show stopper with its tile roof, rear deck and front porch. The rear yard is filled with amazing gardens and an magnificent lawn. 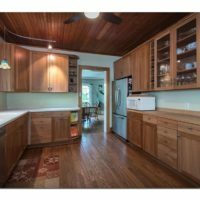 Other features include Corian counter tops, cherry cabinetry, 21 new Anderson windows, refinished floors, electrical upgrades, extra insulation the 3rd floor, and a whole house water filtration system. Cleveland Heights is well known for it’s terrific facilities including great shopping and entertainment. It is a very walkable city with a theater, a movie theater, a library, public parks, grocery stores, art galleries and many restaurants in very close proximity to this gorgeous home.